It’s been quiet awhile since Qualcomm announced their first 64bit chipset. After the announcement the chipset got little or no spotlight as a matter of fact. Now after Google announcing that they are going fully 64bit with ‘Android L’ it seems rumors of 64bit devices are emerging. And the first 64bit device might come from Lenovo. Recently a new smartphone was spotted at a local event in China which was mainly organized by China Mobile. 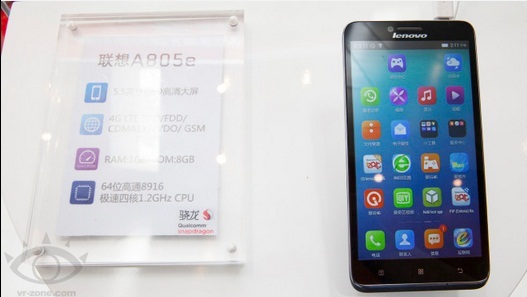 The device in question is from Lenovo and falls under the Phablet category. The phablet model is A805e and according to some sources the device will come out in the middle of next month. For a first 64bit Android device the phablet is actually really decent speced. It has a quad core Snapdragon 410 processor with Adreno 302 GPU, 1GB of memory and 5.5 inch qHD (960×540 resolution display). For storage it has a 8GB internal memory and a 8MP rear camera along with a 2MP front camera will do all the image taking for you. The OS is based on Android 4.4 Kitkat and the device will be backed up by a hefty 2500mAh battery. The device is believed to be priced below $200. These days the low cost smartphones are really becoming popular and especially in China. So it is not a matter of surprise that Lenovo would want to take a share out of it.